May is National Geriatric Care Manager’s Month I will be speaking at the 29th annual Conference of the National Association of Professional Care Manager’s in Philadelphia on Friday April 19th. I will cover the thorny topic, The GCM as the Accidental Mediator: Fretting and Fighting or Feuding: Intergenerational Conflict in the Adult Family at End of Life. If you are interested in attending and learning more you can still register and attend the conference. . 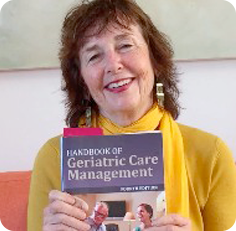 If you are considering this growing profession, I wrote the textbook Handbook of Geriatric Care Management,that is now out in it’s 3rd edition. If you think of opening a GCM agency, I just published the first manual on how to operate a geriatric care management agency My Geriatric Care Management Operations Manual.